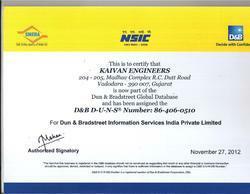 Established in the year 2007 at Vadodara (Gujarat, India), we “Kaivan Engineers” are a Sole Proprietorship firm engaged in manufacturing a premium quality range of Steel Pipe, Steel Tube, Steel Plates, Steel Flange, Exotic Alloy Pipe, Industrial Valves, Instrument Fittings, etc. We procure these products from the most trustworthy and reliable vendors of the market and deliver these within the assured time frame. We also provide Plant Designing Services, Chemical Processing Plant Project Work, etc. in a hassle free manner. With firm support of, “Mr. Diresh Shah” (Business Development Manager), we have gained a prominent position in the market. It D & B rated company. Our group company Nay Engineers has expertise & experience sourcing Technologies, Engineering, LSTK projects and Process Packages, Used Machineries etc. Its business spreads worldwide including USA, China, Japan, Europe and the Middle East and with reputed clients in India. Utilizing decades of experience and knowledge, Kaivan Engineers emerges a leading supplier of premium quality product range & attained a significant position in the market. Able Team of Professionals - Knowledge of reputed suppliers and manufacturers both local and international. Expertise in supply of special grade material. Customer Centric Approach - Supplying all grades of plates & pipes, pipe fittings, flanges, valves, etc. Rich Vendor Base - Representing various reputed Indian and foreign companies. Storage of plates and pipes. Pocket-friendly pricing - Smart Sourcing by tracing the best source from the global market and negotiating the best deal. Well-equipped office, located in center of Vadodara which is 5 kms. away from domestic and international airport.